Everyone wants to look good. Looking good not only helps us feel good, but studies have shown that looking good and presentable has many benefits like high confidence level, higher chances of getting a job and even more earnings. One of the major factors of our looks is our skin. A soft and flawless skin makes us look better and healthier. This is the reason, why the skin care products industry is growing rapidly around the world. There was a time when the skin care market was flooded with products which contained harmful chemicals which in the long run caused damage to the skin. But with more and more research being done on skin care products, people have now become aware of the adverse effects of using chemical containing skin care products. As such, natural, ayurvedic and chemical free skin care products are what the consumers are looking for today. Considering this increasing demand for chemical free skin care products, Fizzy Fern, aims to manufacturing premium quality products which are soft on the skin. These products do not contain harsh chemicals like sulfates and parabens and are cruelty-free too. The revenue earned in the skincare segment in India is US$1,510 Mn in 2019. The market is expected to see a growth of 2.5% CAGR in 2019-2023. Robin chopra is the founder of the FuzzyFern. He has experience working with leading FMCG and Media Companies like SABMiller India and Times of India Group. Nitasha is Robin's partner in business and life. She was a banker prior to the inception of Fizzy Fern. Sugam is the co-founder of Fizzy Fern and also Director of Carbone Products (India). Skin care was always a passion for Robin. He understood that in today’s world, to combat the ill effects of pollution and stress, good skin care products are essential as they help one look and feel healthy and beautiful. Besides Nitasha being a girl was naturally interested in skin care. So they kept exploring the idea over a couple of years. Since they also had manufacturing facilities within the extended family, they finally decided to take the plunge. We wanted to have a more international name that sounded fresh as well as soft. After almost 2 months of brainstorming, the founders came up with the name Fizzy Fern. Fizzy means lively and Fern is a plant. So the name means a lively plant. 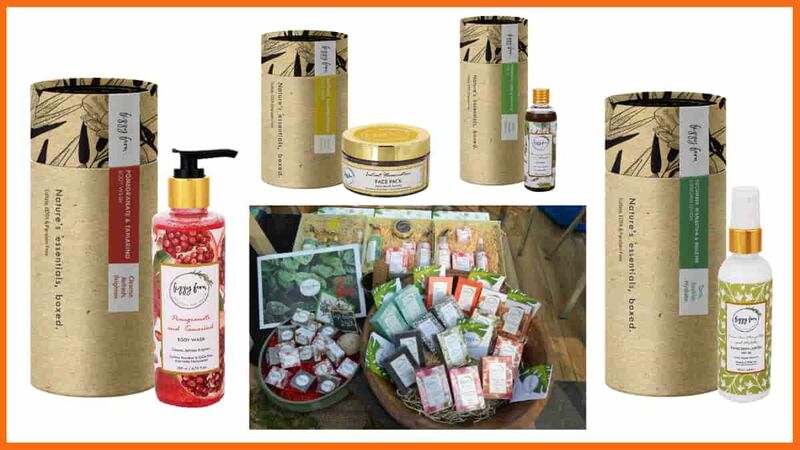 Fizzy Fern has a wide range of products for face care, lip care, body wash, body lotions, scrubs and body massage oils. Besides, the company also has a special range of skin care products for men. Fizzy Fern aims to establish itself as a name associated with premium gifting. So the company has designed great looking boxes containing different skin care products, which are ideal for gifting. We are a skincare brand that also lays great emphasis on the whole unboxing experience. Fizzy Fern has first of its kind packaging for their products. The products are packed in beautiful cardboard tubes, which give a premium look to it. Fizzy Fern has taken the hybrid distribution channel right from the beginning. Fizzy Fern products are available in all leading e-marketplaces like Amazon, Nykaa, Flipkart, Smytten and PayTM and also in the offline retail channel in select markets viz, Chennai, Hyderabad, Bangalore and Dehradun. While a little push here and there gets you the initial trials, if the product is good and keeps the promise, you’re sure to win in the longer run. As said above initial user came from online marketplaces like Amazon, Nykaa etc from the initial stage. Fizzy Fern’s Face Pack, Hair Oil, Sunscreen and Rose Lip Balm were the products that became popular among its early set of customers. Good and positive word of mouth publicity helped the company to broaden its customer base gradually. Read More: Uncommon Facts About Famous Brands, You didn't Know! The Company is bootstrapped till now. We have not taken any funding and thus we are extremely cautious of every penny that we spend. Hence, it’s only been organic launches and organic growth that we’ve seen till now. The most challenging part is to live up to the promise of soft skincare products. Besides, Robin considers competing with big names in the skin care products industry as one of the major challenges. Robin is personally a big fan of the Forest Essentials and Kama Ayurveda. He looks up to these two brands and hopes to create a similar experience. Fizzy fernin the long run, wants to increase its production and market reach. It aims to win consumers with high-quality products.